The Park Service ranger called my cell phone three times in ten minutes. He was concerned about my safety of myself and that of my field assistants, noting that my car was still at the trailhead to my research site at 4pm, and temperatures were well into the triple digits. In fact, we had knocked off earlier than I had planned and were already hiking back, because despite setting up a tarp as a scenic shade ramada, and my constant encouragement to drink more water and more Gatorade, we were overheating. This was a far cry from my last week, when I attempted to climb Mr. Rainier. With a peak at 14,411 feet and sporting the largest glaciers in the lower 48 states, this mountain tested some very different physiological tolerances. Certainly the 1:30am start was cold, and I wore a layer of wool covered by 1-2 layers of fleece, covered by a wind-proof shell over virtually all part of my body. Plus during breaks I added a down jacket over it all. 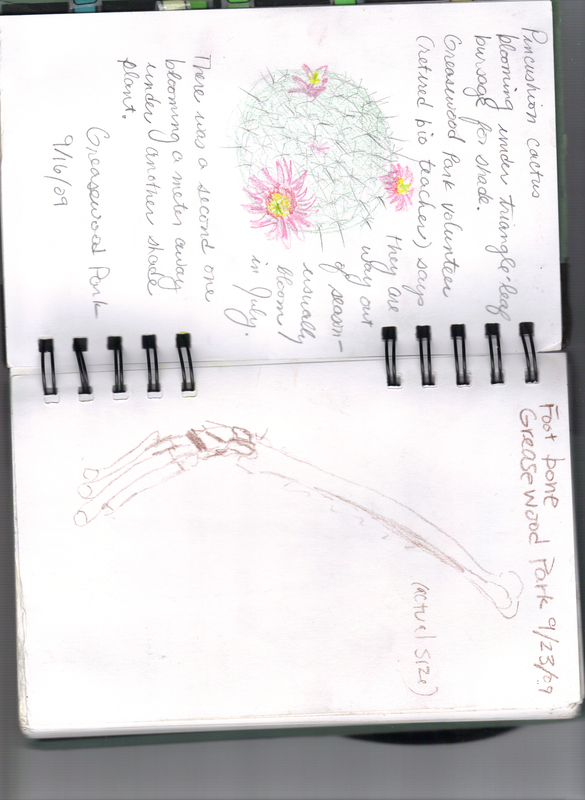 But cold was not the only physiological challenge on the mountain. Ultraviolet radiation is more intense because it has less atmosphere to pass through, and is reflected off the snow in every direction. The first day I only put on sunscreen once, and my face was badly burned. Additionally, the low air pressure and corresponding low oxygen levels present physical challenges in acclimatization and physical exertion. One member of our party started coughing up bloody sputum, which may or may not have been indicative of his having high altitude pulmonary edema (HAPE), a potentially fatal condition. HAPE is, interestingly enough, may stem from the body’s evolved response to fungal infections. So what a relief to return to the balmy lower latitudes and altitudes, right? Highs are well over 100 degrees Fahrenheit in Tucson, though, and my research revolves around low-elevation (hot), south-facing (hotter) slopes covered in dark volcanic rock. But the problem of my field crew’s physiological tolerance not withstanding the Sonoran Desert summer is also a solution for an experimental annoyance. Bruchid beetles lay their eggs inside paloverde seeds. 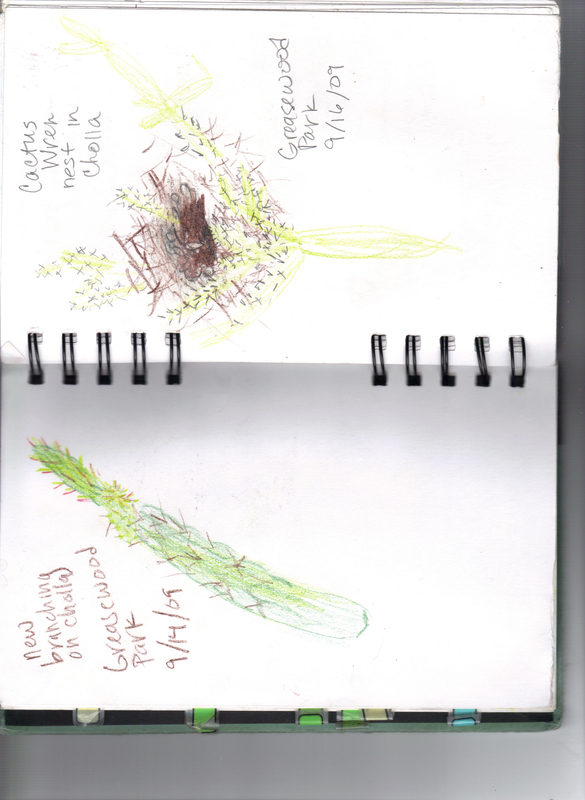 Last year, I had gathered a number of paloverde seeds to use in germination and seed removal experiments. Beetles decimated my stores, emerging from up to 75% of the seeds and attacking the rest inside my insect-proof bags. What if your life and your children depended on living in water, but every so often the pool you were living in dried up? Maybe it was no more than a puddle, and, though part of a flowing stream after every good rain, between storms just disappeared – sometimes? Let’s say you’re an insect, and you have wings to fly off in search of other water, but your offspring won’t for a month or two. Why would you ever lay your eggs somewhere so risky? 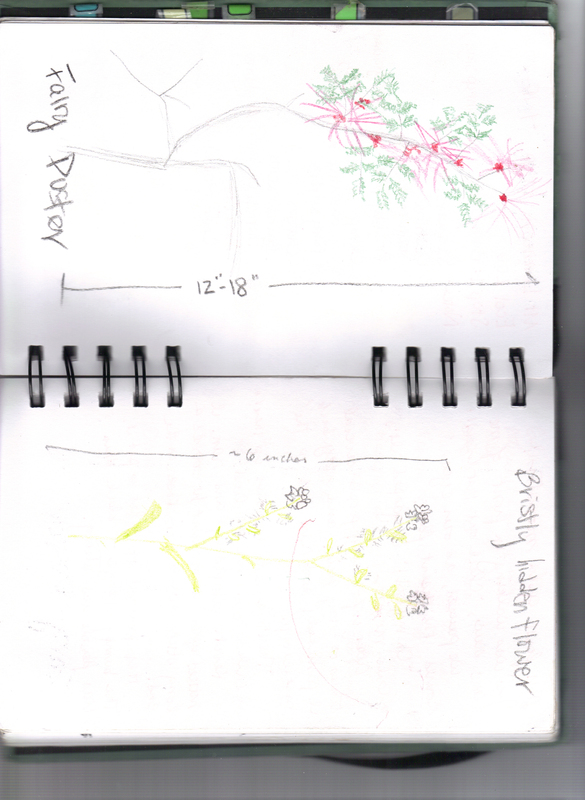 In my last post, I wrote about how the landscape we live in, even a city block, is full of good patches and bad. What makes a spot “good” or “bad” to a dandelion or a dragonfly depends on their individual needs: a dragonfly needs water and plants to land on and other insects to eat, while a dandelion needs soil and light and of course some water, too. But the number of other conspecifics (other dragonflies or dandelions) they have to compete with can also make a patch better or worse. Galen catches something in one of his larger pools. Besides wanting to understand life, the universe, and everything, I want to be a biologist because I like being outside. So I was excited to help another student in my lab with field work last week. 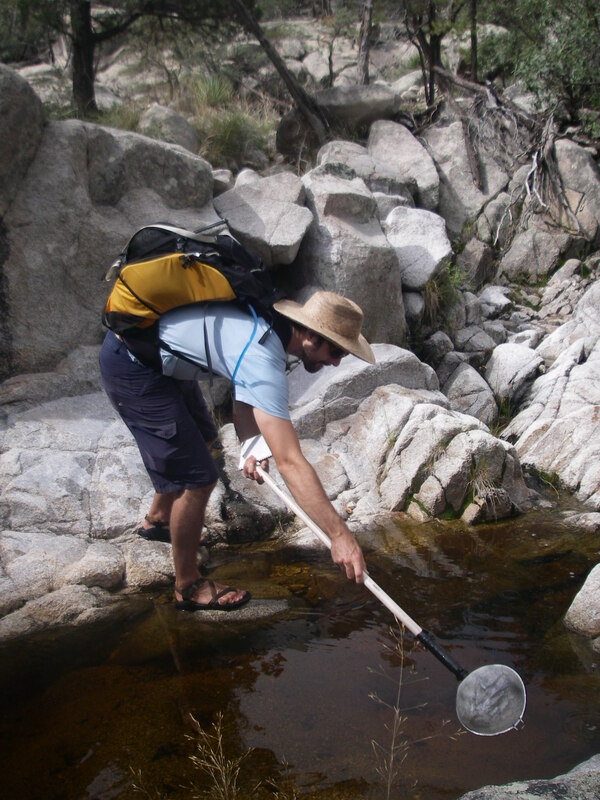 Galen studies stream ecology on Mount Lemmon, the tallest mountain overlooking Tucson in the Santa Catalina range to the north. Specifically, he studies the response to environment and competition in several kinds of aquatic insects. That sounds like a mouthful, so I’ll just summarize that he counts backswimmers and water striders up and down these mountain creeks. 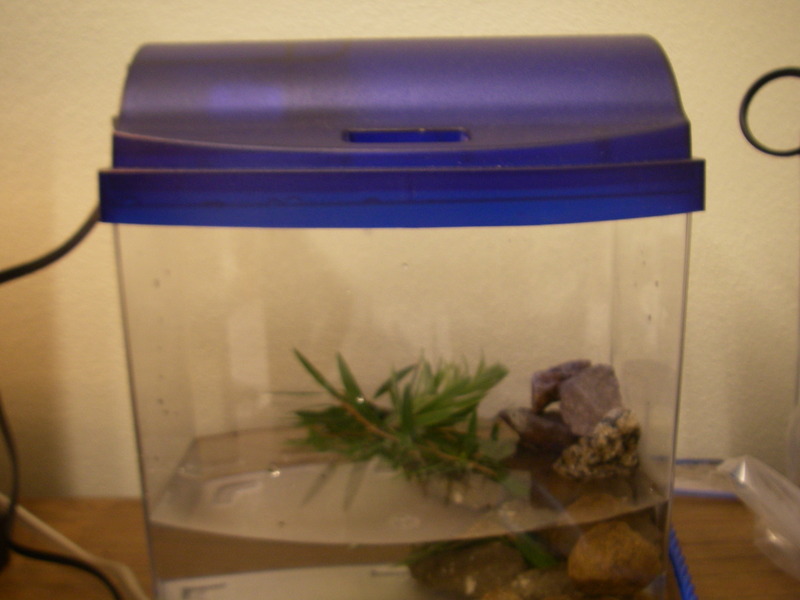 I am planning to study these communities of aquatic insects, too, because they are crazy cool. 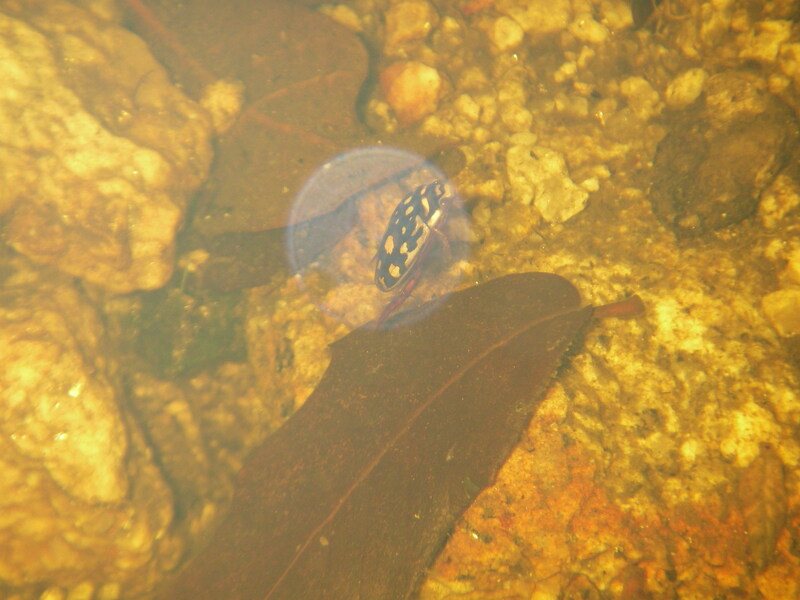 First of all, they have short life spans compared to a PhD timescale (a few weeks to a few years), and are really small, and live in small little pools, so it’s easy-ish to study their population dynamics. Well, easier than studying lions and hyenas on the African savanna anyway, since I can just box these guys up in a kiddie pool or aquarium and watch to see what happens. 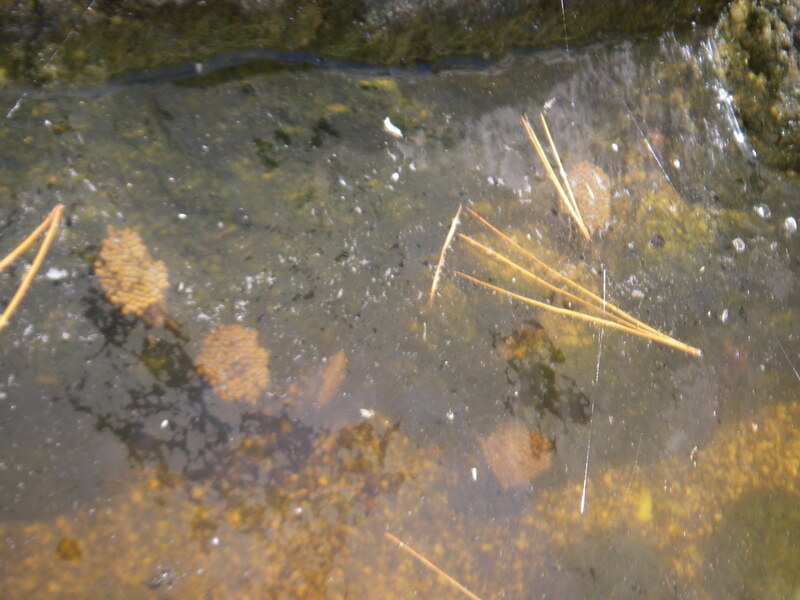 The round things clinging to the rocks below the pine needles are the males of the giant water bugs (Abedus herberti), who carry a raft of eggs on their backs until they hatch. The proud new daddies refrain from eating for about a week, then even their own young are fair game as prey for these voracious predators! But if you get down on your hands and knees, these guys are no less spectacular than crocodiles and elephants. You ever have backswimmers invade your pool? Did they bite you? They haven’t gotten me yet (I scoop them up in a net and let Galen do the handling), but I hear the notonectids (science-y name for backswimmers) pack a punch that’s not as teeny tiny as they look. 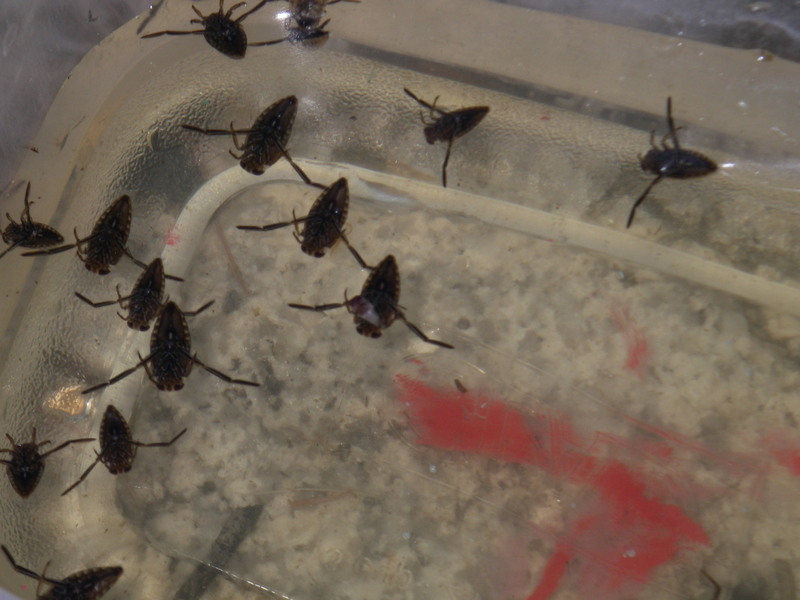 Then there are the “toebiters,” also known as giant water bugs, like Abedus herberti (that last year’s Biosphere 2 fellow Chris Goforth studies and blogs about here). Brilliantly colored sunburst beetles (Thermonectus marmoratus) bustle around the rocky beds of these glorified puddles. What is their business? What are they eating? 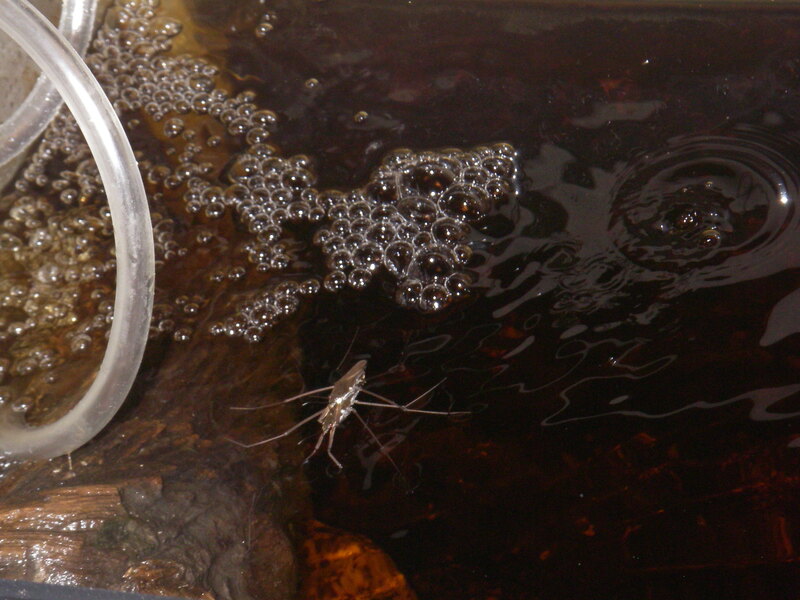 Above them, water striders (Gerridae) skim the surface. 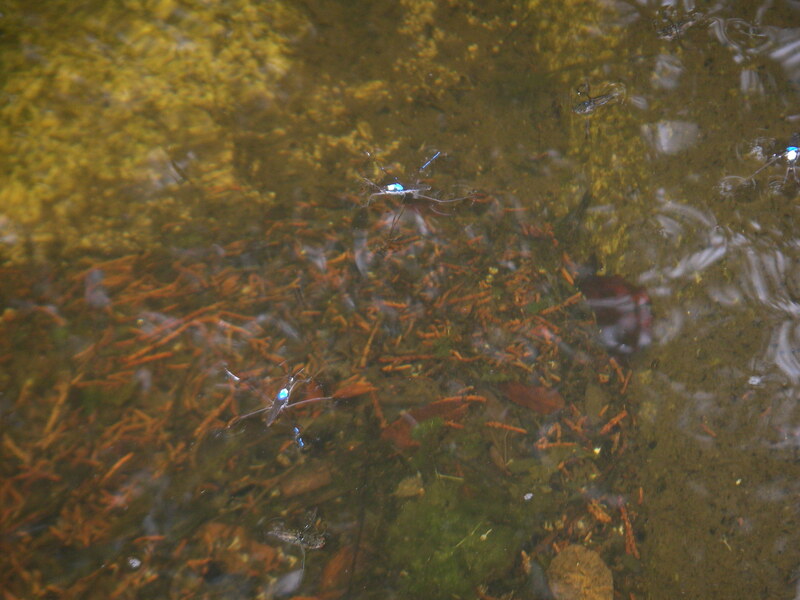 Two water striders (Gerridae) that have been marked white and blue to indicate the pool they were captured in. Just below and to the left of the bottom one, you can make out a backswimmer lurking beneath the surface - the striders better watch out! Beyond the alien-like life forms fighting their daily battles in the pools, liquefying and sucking the guts out of one another, these streams perfectly illustrate the variability I wrote about last time. While after a good rain, water cascades over the Gneiss bedrock like designer waterfalls, most of the time it seems these “streams” dry up into a series of puddles. Some are the size of a hot tub, while others are hardly larger than a pot you would boil spaghetti in. Some are shaded by trees, others bake in direct sunlight, surrounded by bare rock radiating heat back. (Those are absolutely unbearable to count bugs in on a hot summer day, even at the higher elevation.) Some are full of fallen trees, grass, or algae, and others are nearly empty. This year, however, the pools are behaving totally differently. Pools that were always dry last year now boast water after weeks without rain. Ecologists call this spatio-temporal variability, and it can help promote coexistence, just like the spatial variability I wrote about in the last post, although as you can imagine, it gets more complicated when you consider that fourth dimension (time). Spatio-temporal variability and its effects on community structure is what my adviser specializes in, and it’s the title of the class I am taking from him this fall. So why risk the variability when you could opt for a more consistently safe environment? Maybe it’s a case of high risk bringing high reward. A small pool may dry up, but if it lasts, your offspring may have it all to themselves, low competition, low predation. For species with buffered population growth (a relatively long adult lifespan, or a seed bank, or something else that keeps them around), a good year can help more than a bad year hurts. That’s one condition for the storage effect my lab studies. Hopefully Galen can enlighten us in the next couple years about what’s really going on with these pools. 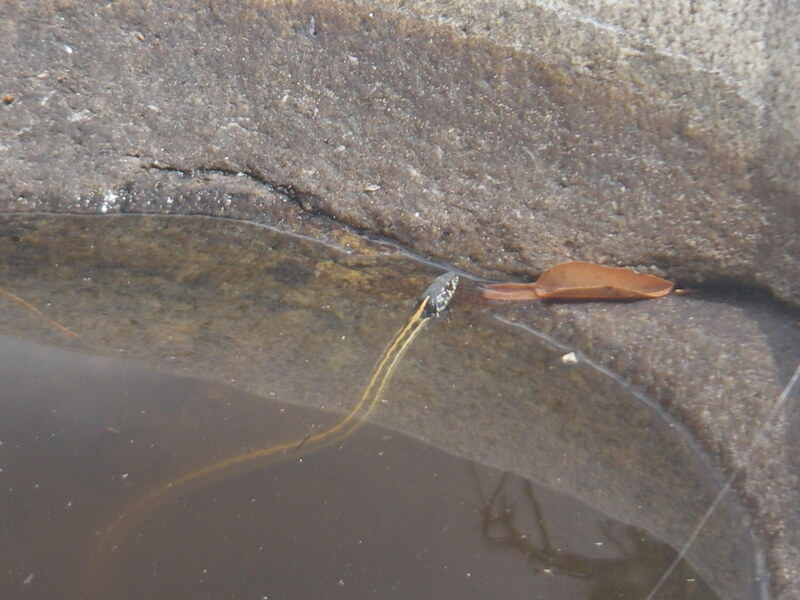 A small garter snake chills out in a bedrock pool on Mount Lemmon.